Readers familiar with Frame's analysis of historic doctrines and current questions will welcome this long- awaited second installment in the Theology of Lordship series. Here he examines the attributes, acts, and names of God in connection with a full spectrum of relevant theological, ethical, spiritual truths. ^^^The Doctrine of God received the 2003 ECPA Gold Medallion Award in the Theology and Doctrine Category. Congratulations, Dr. Frame, for this award reflecting many years of study on the topic of God's attributes and character. P%26R is honored to carry this title. 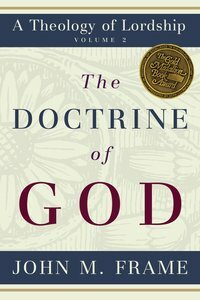 About "The Doctrine of God (#2 in Theology Of Lordship Series)"
Readers familiar with Frame's analysis of historic doctrines and current questions will welcome this long-awaited second installment in the Theology of Lordship series. Here he examines the attributes, acts, and names of God in connection with a full spectrum of relevant theological, ethical, and spiritual issues. John Frame's landmark study of Christian ethics thoroughly applies the biblical counsel of God to the many varieties of human experience. Combining careful scholarship, clarity of expression, pastoral practicality, and a warm commitment to Reformed doctrine, this is a rich resource on all aspects of godly living! The third volume of Frame's Theology of Lordship series, this book focuses on biblical ethics, presenting a method for ethical decision-making, an analysis of biblical ethical teaching focusing on the Ten Commandments, and a discussion of the relation of Christ to human culture. "John Frame's magnificent work on the Christian life fully endorses the authority of Scripture and practically addresses the need to consider the situations and people involved in ethical decisions." Frame explores our relationship with God. He writes we tend to forget how often in scripture God performs His mighty acts so men will know that He is Lord. He thus examines our knowledge of God as it relates to our knowledge of ourselves and of the world in which we live. Part 1 looks at The Objects of Knowledge- which focuses on what we know; Part 2 The Justification of Knowledge- asks What right do we have to believe what we believe and Part 3 The Methods of Knowledge -examines how we obtain knowledge. This magisterial volume presents a rigorous exposition of the Word of God from a classic Reformed perspective. Frame argues forcefully from a presuppositionalist standpoint that holds to the absolute sovereignty of God, in radical contrast to the autonomy of human reason. 684 pages, from P and R Publishing.